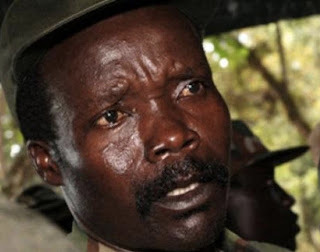 Just a little over week ago the KONY 2012 video began airing on social media sites and since then has gone viral, having 75,150,482 hits on YouTube as of March 13, 2012. The movie was produced by Invisible Children, which is a non-profit organization setup in 2006 to use “film, creativity and social action to end the use of child soldiers in Joseph Kony’s rebel war and restore LRA [Lord’s Resistance Army] affected communities in central Africa to peace and prosperity.” The video is narrated by Jason Russell, one of the co-founders of Invisible Children. Since Kony’s atrocities are relatively unknown, particularly in the United States, KONY 2012 seeks to launch a grassroots campaign to inform each and every member of the global community and ultimately bring the warlord to justice by December 31, 2012. Part of the campaign includes appealing to 20 culture makers (celebrities, athletes, and billionaires) along with 12 policy makers to address the problem, and among other things a mass poster campaign set for April 20, 2012. There are also responses to the critics. Luis Moreno Ocampo, chief prosecutor at the International Criminal Court, who also appears in Kony 2012, noted in a BBC interview that Invisible Children had “mobilised the world,” and that “they’re giving a voice to people who before no-one knew about and no-one cared about and I salute them.” Invisible Children has also posted responses to their critics. CRI has been aware of the activities of Kony’s Lord’s Resistance Army for quite some time, and published the 2005 News Watch piece “Terrorizing the Innocents in Uganda: Religion Plays a Deadly Role in the Lord’s Resistance Army” by Steve Rabey. The article highlighted the cultic tactics used by Kony to indoctrinate children, turning them into brutal killers. I believe Christians are to pray for the Lord to work through people and circumstances to bring Kony to justice and end the terror of the Lord’s Resistance Army. They are to pray for what the Lord would have them do in response to this. Most of all, I believe Christians must prayerfully consider specific ways to strengthen the church in Uganda, so that the Gospel may continue to be proclaimed, for it is the power of God to salvation (Rom. 1:16-17). Moreover, it is on account of hearts and minds transformed by the Word of God that one gains solid theological and spiritual foundations for effective social transformation. There is corruption in the world, but the Christian is the salt and light (Matt. 5:13-14).